Ever since information became available to the public about the possible dangers of aluminum in antiperspirant (specifically because of its close location to breast tissue), safer, more natural alternatives have flooded shelves. Technically speaking, there is no sound scientific evidence that illustrates a cause-and-effect relationship between aluminum and breast cancer, though, some research suggests that when the compound is absorbed into the skin, it has hormonal effects. Still, just the possibility is enough to warrant alarm, and consumers are playing it safe with more body-conscious choices, even opting for straight-up rock crystals to get the job done. If it means protecting your body, why not try a more holistic path? In years past, natural versions weren't as accessible and have had the type of crunchy, granola exterior you'd expect to find in a health food store. But lately, brands have made ditching toxins feel so much more chic, with elevated marketing and the type of packaging you'd proudly display on your vanity. This elevation–and cleaner ingredient list—often comes at a cost, though, which is why it's been exciting to see more mass brands like Secret and Arm & Hammer at least kicking aluminum off of their ingredient lists. The latest drugstore brand to join this movement is Dove, a brand we as beauty editors have used for years, so when the news broke that a safer version was hitting stores, we each grabbed a tube and gave them a spin. Our unfiltered thoughts, below. "I’ll just start off by saying that I don’t really sweat. I know, I know—good for me. Insert eye roll. That being said, I still like to wear deodorant on certain occasions, just in case. I only wear deodorant, not anti-perspirant (which contains aluminum), so I was really excited to hear about this new launch from Dove. I used the Fig and Orange Blossom scent, and swiped it on first thing in the morning. The smell was the lightest and least artificial-smelling out of the bunch, and I liked that it made my armpits smell like they were on summer vacation. By midday, I still smelled fresh, but weirdly, I noticed that I had two tiny sweat spots on my button-up shirt. It was the first time I’ve worn the shirt, so it definitely could have been the material (it’s that stretchy cotton that isn’t exactly what I’d call breathable). The next day, I used the deodorant again, and no sweat marks appeared. I think I’ll be sticking to my fancy-smelling favorites, but all in all, I’m super impressed and excited that a huge brand like Dove is broadening a much-loved product and giving people options." "First things first, it's important to understand that deodorant and antiperspirant aren't the same thing. Antiperspirant forms a plug in the sweat glands to prevent wetness, whereas deodorant kills the bacteria that mixes with sweat and develops odor. And according to one study, antiperspirants can potentially make you smell worse. So even though Dove's new 0% aluminum deodorant isn't an antiperspirant, I, for some reason, feared the absence of something so strong would make me smellier and sweater. That's because, admittedly, I need a pretty strong deodorant (I typically use men's), otherwise I have slight B.O. (I'm human, what can I say?). However, I put the Cucumber & Green Tea scent to the ultimate test—a Kristin Sudeikis dance workout—and didn't smell in the slightest afterward. I've been using it as my go-to for a few days now, and so far, so good. I love that I've found a heavy-lifting formula that keeps me fresh and dry, minus the risk of aluminum. "I'm admittedly a heavy sweater. I've been this way for so long that I'm not even embarrassed by it anymore. Needless to say, I take my deodorants pretty seriously. I've tried everything under the sun—from prescription variations with levels of aluminum so high they can't be sold at the drugstore, to a crystal that you run under water to activate, all with varying levels of success. "As soon as I heard Dove was making a deodorant without aluminum, I needed to put it to the test. For the first wear, I applied it before an intense strength-training workout. I immediately noticed the strong (yet lovely) scent as I swiped it on. After about 40 minutes of intensely working out, I did start to feel like it was wearing off, but nothing terrible (and after all, I was working out). I was still in better shape than I would have been sans-deo; however, I have done the same workout with a regular aluminum-heavy deodorant and felt the Dove version didn't last as long. On my second wear, I really put it to the test: a busy and stressful day at work. When I got home from work after two commutes in a heavy jacket (and countless meetings), it was very obvious that the deodorant had worn off, and by the smell of it, a while ago. Overall, I'd say that if you sweat a lot, this deodorant will work for you, but only if you reapply every hour or so. I'll keep it at my desk for days where I need to freshen up, but for my daily deodorant, it's just not strong enough for me." "I take deodorant really seriously. I don’t sweat a lot, as in, not a ton of wetness, but if I go without deodorant, I can smell the difference. I’ve stayed away from natural and aluminum-free deodorants in the past for that very reason. It’s not that I don’t know the dangers of the chemicals or even because I don’t love natural skincare—I do. But I just haven’t been able to give it up for the sake of my intense B.O. "I wore Dove’s new offering for five days straight. The first few days were an adjustment, I won’t lie, but I really do love that cucumber scent. I didn’t sweat terribly and the formula made it so I didn't smell, not at all. It feels really refreshing and absolutely works. I didn’t work out (because I never work out) and because it’s winter, I think I can definitely hang with this product. Come summer, it might be a different story." 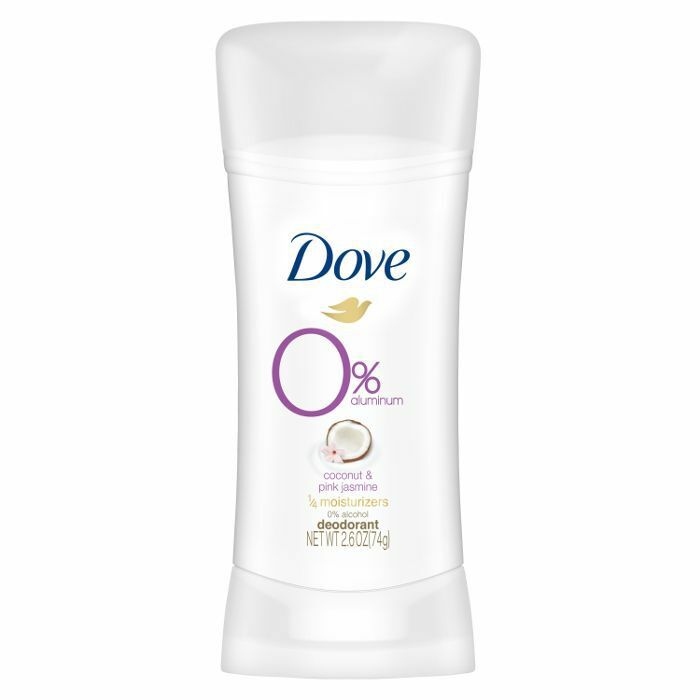 Dove's 0% Aluminum formula is also free of alcohol, leaving your skin moisturized all day. Enjoy four fresh scents: Cucumber & Green Tea, Coconut & Pink Jasmine, Blue Fig & Orange Blossom, and Pomegranate & Lemon Verbana. Next up: This is why your natural deodorant isn't working.